I chose the "immortal DAIQUIRI" as my drink this evening for several reasons. One, Autumn is about to get in full swing, so this is the last chance for a tropical drink. And two, I have procured a bottle of five year old Havana Club Anejo Rum. So I really didn't have a choice. 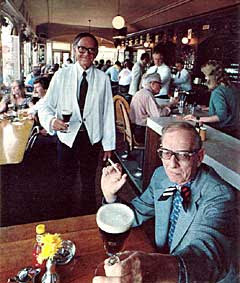 Charles H. Baker, Jr. holds the Daiquiri in the same league as "the Martini, Manhattan, Side Car, and other immortals." He claims to have imbibed this cocktail in such famous Cuban haunts as "the Havana Yacht Club, Country Club, Hotel Nacional -between revolutionary bombings-Sloppy Joe's, La Florida, the Bacardi Building..." and it seems every place in between New York and Shanghai. Have Daiquiri ingredients, will travel should have been Mr. Baker's mantra. Baker warns not to make the drink too sweet. So ease up on the sugar, use simple syrup. The sour lime juice flavor with just a hint of sweetness, mixes perfectly with the chilled aged Rum. If using dark or aged rum, use less sugar. White rum, more sugar. Where to get a great Daiquiri? The JakeWalk on Smith Street in Brooklyn. Barkeeps Ari Form and Matt Devriendt use Zacapa 23 Year Rum from Guatemala, serve it in a vintage crystal goblet, and leave you with the best Daiquiri north of the Tropic of Cancer. Tough day at work and I'm in the mood for a stiff drink with a splash of effervescence. I leafed through The Gentleman's Companion: Vol II and found just what I was looking for, THE MID-OCEAN HIGHBALL. Mr. Baker refuses to acknowledge this drink as a "highball", he writes "contrary to native title is a legitimate fizz, being an exotic from Bermuda." He is partially right. I wouldn't classify this cocktail as a fizz anymore then I would call it a highball. There is no citrus and only chilled soda to taste. Also the gin, cognac, and vermouth seems wasted in a highball glass. So I went with serving the "highball" err I mean "fizz" in a chilled coupe. Shake well with cracked ice, strain into chilled highball glass and add chilled club soda to taste. Twist on a bit of green lime peel. (I stirred the drink). Where to get this drink? Good question. I have never seen it on a local cocktail menu; I assume they still serve it at the Mid-Ocean Club in Hamilton, Bermuda. 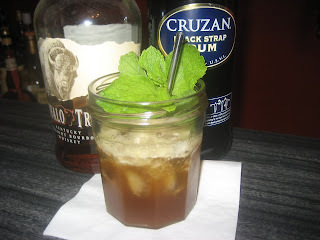 However, if you aren't game to hop the Pan American clipper, there is one place one could ask for the Mid-Ocean and get served proper - St. John Frizzel's Fort Defiance in Red Hook, Brooklyn. The man knows his Baker cocktails. Tonight, I am capping off the weekend with a NEW ORLEANS FIZZ No. I, with old Tom gin and Kirschwasser*. 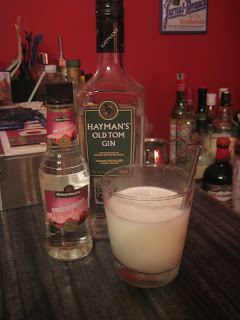 This cocktail is a cousin of the Ramos Gin Fizz (which I will be drinking in a week or so)with a slight bouquet of cherries. Combine in Shaker over cracked ice, and strain into goblet (I used a chilled high ball glass)and top off with club soda. 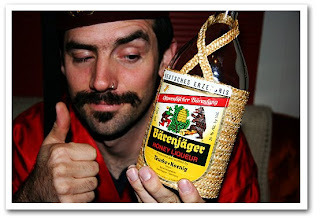 *Kirschwasser is a German cherry brandy made from fermented black cherries and distilled in wood containers. 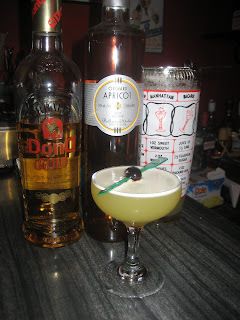 To celebrate five days of Charles H. Baker, Jr. cocktails from the Gentleman's Companion, Vol II: The Exotic Drinking Book, I decided on a drink that travels the same way as our protagonist - first class. Mr. Baker describes the cocktail, THE ASTOR HOTEL SPECIAL as" from Shanghai, during a Trip around the word in the Year 1926, & on the occasion of our becoming marooned in that city, with our own ship & personal belongings gone on to HongKong, & with a delightful young maiden by whom we were later rejected in marriage, & who later distinguished herself by espousing a very nice gentleman whose main claim to fame is that he was once kidnapped by Karpis* prior to the latter's entering his suite in Alcatraz." Can you imagine being "marooned in Shanghai" at, God Forbid - The Astor Hotel? So naturally they went right for the Cognac and Absinthe. Proposed to some dame at the bar (I'm sure there were others)who later became entangled with a victim of the Ma Barker gang. Some life this guy is leading. He is the Indiana Jones of pre-second world war cocktails. Shake well with cracked ice, strain into a tall wine goblet (I used a coupe) then top off with chilled soda. Make no mistake, you taste the 3/4 ounces of anisette flavor regardless if using pastis or absinthe. The cognac takes a back seat. 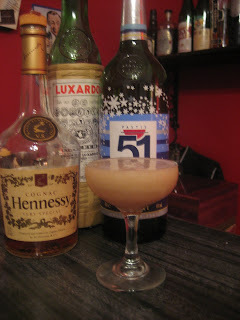 I think more cognac (2 full ounces), lemon and egg white would have embodied the cocktail with a more robust flavor and lessened the effect of the anisette. I like this drink, for sure, however, I wanted a hint of pastis not a full palate of the flavor. "The historic venture started on a November night back in 1952. That's when Jack Koeppler, then-owner of the Buena Vista, challenged international travel writer Stanton Delaplane to re-create the highly touted "Irish Coffee" served at Shannon Airport in Ireland. Intrigued, Stan Accepted Jack’s invitation." 57 years later, it's 2:58AM on a Sunday morning in San Francisco. And our own Effervescent drums up some pocket change, for a cable car down to the old Buena Vista Cafe. How else to top an evening of Gin Gimlets and conversations down at the (strictly off-limits) Officers' Quarters inside historic Fort Mason, which sports that million dollar view of the Bay. How he does it? We may never know. But he does it. The Irish Coffee at the Buena Vista Cafe is iconic. They use the same 1952 recipe and serve over 2,000 coffees a day. We can see why. The 48 hour-aged cream, floating atop six ounces of caffeinated heaven. A full jigger of Irish Whiskey (We believe Tullamore Dew). Worth the wait, indeed! See how they make it. From Bombay back to Cuba, this time to the eastern city of Santiago de Cuba, for Charles H. Baker, Jr.'s DAISY de SANTIAGO which the world traveling journalist characterized as,"..a lovely thing introduced to us through the gracious offices of the late Facuno Bacardi, of lamented memory." Baker goes on to laud the Bacardi people, crediting them with the "immortal" Daiquiri and going on about the free booze at their tasting location in Havana. I can't really imagine Mr. Baker or his entourage ever really had to pay for liquor, whether that be in the Pearl of the Antilles or elsewhere in their travels. Fill big thin goblet to the brim with shaved ice (I used a chilled high ball glass). 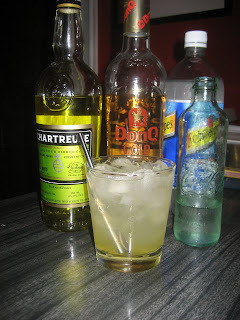 In a bar glass, add the Rum, lime, syrup, stir well and pour over the ice into the glass, stir once more, garnish with mint and fresh fruit (I skipped the fruit), and float the yellow Chartreuse. A splash of club soda "adds a sparkle." The Daisy is reminiscent of the Daiquiri, yet is sweet and fizzy. Slightly tart at the beginning thanks to the lime, as Baker points out, the yellow Chartreuse sweetens up the drink. The splash of soda adds effervescence to an already refreshing cocktail.Salud! Where to get a DAISY de SANTAIGO? Try The Varnish in Los Angeles, California. Charles H. Baker, Jr. describes this cocktail as coming "from the Taj Mahal Hotel, on Apollo Bundar, Bombay, Saturday February 14th, 1931, to be exact; served after the running of the Maharajah of Rajpipla Gold Cup at the Western India Turf Club." Stir in bar glass "like a Martini and serve in Manhattan glass, ungarnished" check and check. Bartender Giuseppe Gonzalez made me a Turf No 2 several months ago and his rendition is clear. 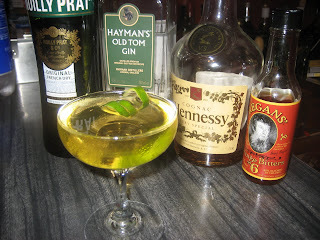 The Noilly Pratt gave my version a yellow color, so I am curious to know what type of vermouth he used. But the taste is unmistakable. A medley of botanicals from the maraschino and absinthe mixes with vermouth. Beefeater, a tough as nails gin, stands up well to the flavor assault. Where to get this cocktail, try Dutch Kills in Long Island City, Queens, NY. "We are still heartily of the opinion that decent libation supports as many million lives as it threatens; donates pleasure and sparkle to more lives than it shadows; inspires more brilliance in the world of art, music, letters, and common ordinary intelligent conversation, than it dims." - Charles H. Baker, Jr.
To kick off my favorite season, sweet, sweet Autumn, I am embarking on a trip in renown tippler and world traveler Charles H. Baker Jr.'s shoes. For the next two weeks, I will enjoy one cocktail daily from The Gentleman's Companion: Volume II originally published in 1939. I know this type of trip has been done before. I am not doing this to be original but rather as a challenge to my palate and cocktail knowledge. It will require fortitude, discipline, and a cast iron liver at times. There will be no repeats and though I have never attempted a cocktail marathon I've been training for years. My first drink is the REMEMBER THE MAINE. 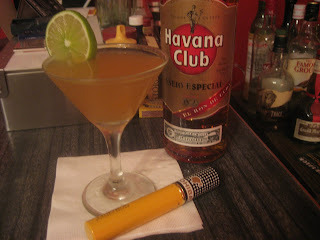 Baker describes the drink as "a hazy memory of a night in Havana during the unpleasantness of 1933*. when each swallow was punctuated with bombs going off on the Prado, or the sounds of 3" shells being fired at the Hotel Nacional, then Haven for certain anti-revolutionary officers." Stir briskly in a clock-wise fashion and serve in up twisting a curl of green lime or lemon peel. (We went with lemon. )Though Mr. Baker suggest serving into a chilled saucer champagne glass, I decided to go with a chilled highball glass. This cocktail is quite potent so I substituted Pastis 51 instead of Absinthe which would have put it over the top. It reminds me of a Manhattan cocktail but sweeter thanks to the cherry herring and yes has the unmistakable hint of anisette flavor due to the Pastis. The recipe would probably is better with a lemon peel but lime could also do the job of adding a bit of citrus to cut the sweetness. 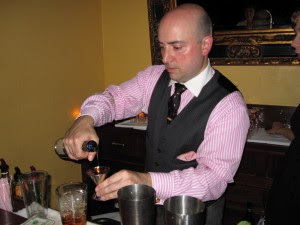 Other places that I recommend to enjoy this authentic Charles H. Baker, Jr. cocktail: Fort Defiance and Clover Club in Brooklyn, NY, USA. * Baker refers to the Revolution of 1933 in his description of Remember the Maine. Out of the "unpleasantness" came Fulgencio Batista, the strong man who would rule Cuba on and off until being deposed by Fidel Castro in 1959. 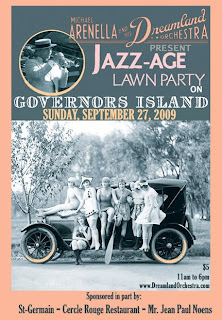 Destinations: Fall Jazz Age Lawn Party on Governors Island. Under a shady grove of centuries-old trees, caressed by fresh sea air, a sprawling green surrounded by historic officers’ quarters and 18th century naval ramparts becomes the setting for a true Gatsby affair. A recession-friendly $5 admission gives you access to one of the Fall's most magnificent celebrations.. Widely anticipated by flappers, sporting gents and tiny tots alike, this event has been featured and reviewed consistently by The New York Times and the Sartorialist. - A delightful variety of refreshing cocktails will be served by St. Germain. - Picnickers are welcomed and encouraged. - Tasty sandwiches and BBQ provided by Cercle Rouge. - Authentic '78 records from the 1920s played on a phonograph provided by Michael Cumella of WFMU's Antique Phonograph Music Program. - Charleston lessons given by dance legend Roddy Caravella of Sandra Cameron Dance Studio. - 1920s Motorcar Exhibition - take a spin around the island in a genuine rumbleseat; hold on to your hat! - Vintage clothing dealers and boutique milliners - They will all be peddling wares, so be sure to tuck some cash into your garter. 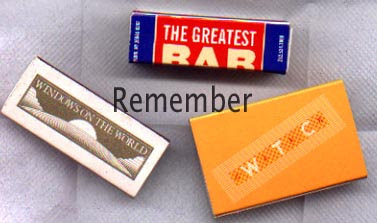 - Special literature/ephemera booths and readings by the Dorothy Parker Society & F. Scott Fitzgerald Society. -Swimsuit competition - for women and men! - Vintage portraits by R.A. Friedman. - Pie Recipe Contest - Categories: “Mom’s Best,” “Best Savory,” "Most Deliciously Unusual," and “Hobo’s Choice”. Special Prizes and coveted gift certificates to be awarded. Help support the Lawn Party by baking! If you have a bakers touch, please bake some goodies to be sold on Governor's Island on Sept 27th. If you wish to participate please contact Cameryn Aims, camerina84 at gmail dot com. Include your Name, Email and Phone Number, and a Description (including quantity) of what you plan to donate (so we can adequately showcase your fine goods.) Also, let us know the best way and time to contact you. Please submit all information no later than Sept 20th. Remember, this is an all day event, so please bake accordingly (things that travel well and will hold up as we have fun in the sun- cookies, brownies, and cup cakes work well.) Thank you and we look forward to seeing you there and sampling your wares! Ringmaster Shien Lee sends us word of another outlandish Dances of Vice event. This time Loungerati's Fredo get behind the bar to conjure up a potent punch and assist with the bard stuff. This is sure to be an eye opening evening. Behold! Behold! A circus of wonder and depravity awaits you at Dances of Vice: The Cursed Circus, in a magnificent display of freaks, fools, fire, and frippery that will astonish and delight! Abandon all virtue as ring-mistress GIOIA MARCHESE and her deadly cohorts at COMPANY XIV lead you through a world of sensuous marvels! Featuring ISENGART, the captivating libertine of the cabaret underworld - An arousing spectacle of flames by Priestess of Fire SKY CLAUDETTE and Vlad of Eros Fire - The salacious rapping of the tap-dancing MINSKY SISTERS - Magician and performance bizarrist MICHAEL CARBONARO - Raucous carnival melodies provided by BEN ICKIES' Ja Ja Jas Band with hostess and circus songbird SHIEN LEE. Also, for one night only, outré pop surrealist MUFFINHEAD displays his otherworldly paintings and prints as well as his own largely exclamational attire! DRESS CODE: Bohemians, Clowns, Jugglers, Strongmen, Lion tamers, Human oddities, Sideshows, Diviners, Victorian villains, Harlequins, Flappers, Festive fops, Vamps, Madmen, Vintage, or your most deprived attire requested. NOTE: Spontaneous circus acts and performances are welcome! Fiendish beasts of the natural world to astound the most stoic of hearts, winking beauties to set your blood aflame, devillish clowns and countless temptations await you this one sinful night at Dances of Vice. So come one, come all, to the most bewitching show on earth! Win a glittering array of prizes from our sponsors LIME CRIME Makeup, HENDRICK'S GIN, PD CAGLIASTRO, MOLLY CRABAPPLE, WIT'S END, FORIEIGN AFFAIRS, TEMPUS FUGIT, PUREVILE! and more in the raffle! * RSVP on Facebook as "Attending" to receive a free raffle ticket at the door! Specialty cocktail menu for this event presented by your bartenders LUCAS LANTHIER and FREDO from LOUNGERATI. 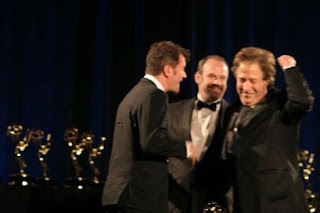 We would like to congratulate our pal J. Walter Hawkes on his second Emmy Award for his work on the Nickolodeon's Wonder Pets. The award is for "Outstanding Achievement in Music Direction and Composition" and it's the same award his team won last year. I am not going to get into to the 9/11 rhetoric which sometimes smacks more or revenge than remember. Overall, we believe in the best that this day represents. New Yorkers and all Americans remember with choked up words when we read the names of the fallen, especially the names we know. I want to dedicate this post to the restaurant workers at Windows on the World who lost their lives that fateful Tuesday. They were part of the the working class ordinary day to day folks who make our city great - yet they perished. Salute to you! Thank you! Loungerati's resident cocktailian Fredo joined jazz crooner Michael Arenella and his Dreamland Orchestra providing entertainment for the Montauk Club's First Thursday event. The Montauk Club is a private social club based on 8th Avenue in Park Slope. The Club was founded in 1889 and has remained a private club since its founding. The magnificent Club House was designed by the famed New York architect Francis H. Kimball, who was inspired by a palace on Venice’s Grand Canal. The Club House was completed in 1891 and its Venetian gothic architecture, carved mahogany woodwork and beautiful stained glass windows remain its signature features. Fredo was stationed at the vintage wood bar making drinks in the historic Oak Room. The cocktail menu included summer favorites such Pimms Lemonade, a "bathtub" Gin Rickey with Hendrick's Gin and muddled cucumber, a St. Germain & Champagne apertif, and an ode to the neighborhood called The Park Slope (Rye, Apricot brandy, Punt a Mes, bitters). 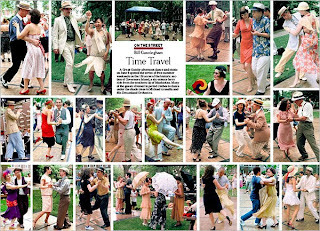 While Fredo kept the Montauk members thirst quenched, Michael Arenella and his band played roaring 1920s jazz while visiting jitterbugs, like Kristen Minsky of the tap dance sensations the Minsky Sisters, cut a rug. What a way to say goodbye to summer! Read more at the Montauk Club Event News. Tales of the Cocktail kicked it all off in New Orleans and now finally New York has a Cocktail festival of it's own. The Manhattan Cocktail Classic will be the place to be for drinks aficionados, mixologists, bartenders, cocktail geeks, and ubiquitous brand ambassadors. The Classic is New York City’s first ever multi-day event celebrating the history, contemporary culture, and artful craft of the cocktail. Loungerati will be dispatching Fredo to attend a Stories from the Bar series and some seminars. You can be sure he will be holding court at the Astor Center bar in between classes. Tickets went on sale at 7:33 pm on September 8th, get them while they are available! Once the last legal cocktail was served on the eve of Prohibition in New York City, things would never be the same again. ‘Have cocktail shaker, will travel’ was the mindset of many a passionate barkeep in the 1920s when their craftsmanship turned criminal. Join Charlotte Voisey, Simon Ford, and other assorted friends for a jovial discussion on how New York has been influencing cocktail culture around the world for many years. Liquid refreshments will be served. Famed (and oft-elusive) owner and proprietor of Milk and Honey Sasha Petraske will demonstrate the basics of creating cocktails in the home. He will go over how to set up and stock home bars of varying degrees of seriousness, as well as cover different scenarios of cocktail entertaining – from temporarily taking over your friend’s kitchen for a house party, to grabbing the reins at a fully-equipped bar. And of course, Sasha will teach you how to prepare some basic, ever-pleasing libations for these occasions. Participants will leave armed with a no-fail recipe list and a short set of directions for preparing basic cocktails with block ice and fresh juices. There is a heritage and culture associated with Tequila and Mezcal that dates back well over a thousand years, when the agave plant – also known as the maguey – was utilized by Mexico’s native peoples for virtually everything: from food and drink, to sugar, to shoes, soap, building supplies, and even medicine. Join us for an exciting tasting of this exotic elixir, each by artisan producers, as we pay homage to the heritage, history and culture of Mexico’s national spirit. It is also likely that agave-based libations will be consumed. This one-time-only, comprehensive seminar joins celebrated master mixologists Julie Reiner and Charlotte Voisey with America’s spirits guru F. Paul Pacult on an extraordinary excursion deep into France's legendary AOC grape brandies, Cognac and Armagnac. Participants will first be taken on a guided tour of tasting a half-dozen remarkable brandies to see how these distilled and oak-matured cousins compare and contrast. Then, they will be treated to a Cognac cocktail, made by Julie, and an Armagnac cocktail, made by Charlotte. A rare opportunity to spend 90 minutes with three of America's most engaging spirits and cocktail personalities. Among all the classes of American mixed drinks—the Cobblers, Sours, Fizzes, Coolers, Juleps and all the rest—the Cocktail stands as first among equals. If there’s something about a quick jolt of ice-cold, mixed-up boozy deliciousness that’s essentially American, then it’s quintessentially New York. And indeed, while many other cities have made key contributions to the Cocktail’s development, none has done so much as to shape it as Gotham. This seminar will attempt to track the interventions the city’s mixologists made in the idea of the Cocktail during the 110-odd years between its first documented appearance here and Prohibition. Liquid exhibits will be served. Audrey Saunders, Libation Goddess from New York’s Pegu Club, and perhaps the bartender most responsible for the resurgence of gin in the 21st century, will join Gary “gaz” Regan, author of The Joy of Mixology (2003) and The Bartender’s Gin Compendium (Fall 2009), to present gin-based cocktails, old, new, borrowed, and, well, you get the picture. They will wax lyrical on all things juniper; they will pontificate endlessly about the attributes of the Martini and of the MarTEAni, and they will display the splendor of cocktails made with dry gin, genever, Plymouth gin, and a most peculiar Old Tom. It’s probable that Saunders and Regan will flirt shamelessly throughout the workshop. The throwing of rotting fruit or vegetables will not be permitted. The choice of glass can mean the difference between a successful and elegant drink, or a glass of booze. In a commercial operation, the choice of glass can impact dramatically on the bottom line. At the home bar, the choice of glass can have an impact on the success of your cocktail party, and the well-being of your guests. Explore the classics with Dale DeGroff as he culls his glass collection to find the perfect glass for well-known classics and the tools to make them successfully. Meet me down by The Bowery. A Savor to be kissed by kisses. Ryes at the day break. As the shadows enter over Astor. Sherry has long played an important role in the world of mixology and has emerged in this new age of the cocktail more popular than ever. Join Master Mixologist and U.S. Sherry Ambassador Andy Seymour for a fascinating look at one of the world’s most cocktail (and food) friendly wines. Taste five of the finest Sherry, representing its many styles, and sample cocktails that show off Sherry’s traditional side and what it is up to today. Come ready to shake, as Andy will lead the group in building their own version of the Sherry cobbler! In between the seminars, one can enjoy cocktails crafted by New York's best mixologists at the Official Bar of the Manhattan Cocktail Classic all afternoon long in The Lounge at the Astor Center. We will also be attending the Stories From the Bar series of talks and drinks being held on-site at reknown cocktail destinations such as Death & Co, Employees Only, PDT, Pegu Club, and many others. Sunday Night will culminate with the Sunday Night Spectacular at the New York Public Library's Astor Library. This black tie affair with feature twelve individual bars, big band jazz, Vince Giordano & The Nighthawks, and a prohibition style dinner. We suggest taking the next day off from work if you have a 9 - 5.